We launched this project at Vale Community Hospital in Dursley in April 2016. We have developed unused ground at the front of the hospital and installed over 40 raised bed allotments which are available through social prescription or for local individuals and groups interested in growing their own fruit and vegetables. We have also planted an orchard, and developed the beds around the hospital with our volunteers who join us for a weekly gardening club. We have very gratefully received support from funders and the local community and in the last few years have been able to continue to develop the site and build a further section of raised bed allotments. The Vale Community Hospital opened on the Littlecombe site in Dursley in 2011 at a cost of £10 million. Local volunteers have since raised considerable funds to pay for more equipment and increase the quality of care for patients. The garden and allotment development was planned by Amanda Godber of Down to Earth Stroud for three years, alongside local GP Dr Simon Opher. Amanda says: ‘Linking health, nutritious food and physical activity by developing the unused land at the front of the hospital into a suite of allotments for local community groups and social prescribing is such a valuable project. We hope to work with local community groups and involve the community in the whole project.’ This is the first project of its kind in the UK. Our launch on 15th April 2016. Thanks to all who came out! There is a growing body of evidence to support gardening and Horticultural Therapy use in patients with improving a wide range of conditions, including physical and mental health problems as well as helping with obesity, lack of exercise, healthy eating, stress, anxiety and social isolation. The development of this unused area of land will help to advance the quality of care and aftercare for patients, vulnerable people and the wider community. Individuals can apply for an allotment through the new social prescription initiative and can be referred by their GPs and other health staff. Support is available in starting an allotment and there will be workshops on different aspects of growing food successfully. Each allotment will be in a raised bed measuring 16’x4’. There will be special matting and ramps to allow wheelchair access, plus a large shed for storage of equipment, seating and tea and coffee making facilities. In addition to patients being directly referred, it is envisaged that patients who have experienced heart attacks and angina can use the allotments as part of their cardiac rehabilitation. Patients will be referred using a Social Prescription which links patients with non-medical sources of support within the community. Others to benefit will be local people who are on waiting lists for allotments in Dursley or live nearby. The area will be fully landscaped with flowers and herbs and the planting of fruit trees to create a small orchard. 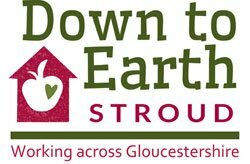 The initial set up of allotments will be organised by Down to Earth Stroud with support from Bisley Community Composting Scheme. Workshops for allotment holders will also be run on a range of relevant topics including an introduction to composting, sowing seeds, which way up to plant your onions and pollinators and predators! We are running a Gardening Club every Thursday from 9am-12pm. Anyone is welcome, and you can do as little or as much as you like. We need help with developing the gardens around the hospital, weeding and planting, and to help build the allotments and plant fruit trees. We would love to have you join us. Anyone interested in work experience or in seeing what working in gardening involves this could also be very useful experience. We are also looking to work with volunteers and interested allotment holders including community groups and for community involvement in the development and the creation of workshops to develop skills and knowledge. Sponsorship and donations are also welcome including any plant donations. If you are interested in volunteering or being involved in any way please email: valehospitalallotments@downtoearthstroud.co.uk or call 01453 700011. Our Facebook page has photos, news, updates and information about events, please like it here. Please also see our blog for several news articles about the allotment scheme and photos of our progress, including our new sculpture installed in June 2018! Read the February 2019 evaluation of the allotments scheme so far here. The project is supported by the Gloucestershire County Council Active Together scheme, Vale Community Hospital League of Friends, Dursley Town Council, and the NHS.